After an accident at a Japanese nuclear power plant where Joe Brody (Bryan Cranston) and his wife, Sandra (Juliette Binoche) work, Joe becomes obsessed with finding the cause of the accident. 15 years later, Joe is arrested for trespassing in the quarantine zone cordoned off by the Japanese government. Joe’s son, Ford (Aaron Taylor-Johnson), must go to Japan to get him out of jail. While Ford is with Joe, they find themselves back in the power plant, where Joe’s fears become a reality. When the situation at the power plant gets out of hand, Joe’s former coworker, Dr. Ichiro Serizawa (Ken Watanabe), needs Joe’s help to study the situation. A giant creature feeding off the nuclear power fights its way free from containment and flies off. Dr. Serizawa fears that this creature has awakened an ancient enemy that was driven to the depths many years ago. The nuclear “tests” that were conducted in the Pacific Ocean were actually attempts to destroy Godzilla. With this new creature, now threatening the United States, Godzilla has risen to hunt his new prey. The U.S. military, now with Ford in tow, is looking for some sort of military operation to defeat these enormous threats to its citizens. Dr. Serizawa proposes a more natural solution to the problem. Godzilla is probably the world’s most famous monster. He is back in probably the biggest blockbuster style film of 2014. It is huge, loud, and action-packed. A discussion I had after the screening revealed that this latest incarnation of the enormous lizard is more of a 1970’s Godzilla, and less of a 2014 big budget monster movie. A stark contrast to last year’s Pacific Rim. This puts a slightly different perspective on the film, if you come in with these expectations. Honestly, it has been quite some time since I have seen any of the original Godzilla movies. After this conversation, I feel I may need to revisit the originals. At the beginning of the film, I was asked if Bryan Cranston and Juliette Binoche were the biggest names in the film. The answer is yes. Aside from Ken Watanabe, most of the actors aren’t big names you would recognize. A bit of a surprise for the big action movie of the year. It worked for Pacific Rim, why not for Godzilla? Bryan Cranston sells his character driven almost to the point of insanity, at least from the point of view of his son and those around him, at his determination to find the source of the accident. Given the consequences of the accident and Joe Brody’s expertise, it is believable that he would go to such lengths. Ken Watanabe plays the role of the quiet, wise Japanese man who realizes that the present situation is one that we cannot control, and that nature will take care of itself. It is stereotypical of these types of films, but it works. Aaron Taylor-Johnson and Elizabeth Olsen, as Ford’s wife, Elle, aren’t quite as convincing. I don’t necessarily put all of this on these two. Some of it must be pinned on the script. There are a lot of convenient coincidences that help move the plot along, but present some significant plot holes. More so for Aaron Taylor-Johnson than Elizabeth Olsen. Ford just happens to be an explosives expert, who the military just happens to let tag along on their highly sensitive mission. The special effects team deserves most of the credit for the film. The visuals are excellently done. If you suspend reality for the actual story and overlook some plot holes, you end up with an ok movie. It wasn’t as good as I had hoped for the “biggest” movie of the summer. Perhaps, as I stated above, it is because I am used to the 2013-2014 style blockbusters, and this is trying to stay more loyal to the originals. Either way, it is far above the Matthew Broderick version of several years ago. 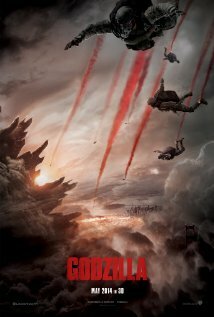 If you are going to see Godzilla in the theater, I would have to recommend seeing at an IMAX theater. The most legendary monster of all time deserves it. Otherwise, wait and watch it at home.